Caryophyllales have long been recognized as a natural assemblage (e.g., Braun 1864; Eichler 1875-1878). Previous circumscriptions based on morphological and embryological characters recognized up to nine families, and subsequent classifications that pioneered the use of chemical and anatomical characters included 12 families (e.g., Dahlgren 1975, 1980; Takhtajan 1980; Cronquist 1981; Thorne 1983, 1992a, 1992b). These circumscriptions remained largely intact for the past 30 years until recently when molecular phylogenetic analyses started reshaping concepts of Caryophyllales. 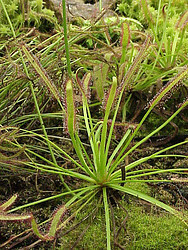 Most notable is the discovery that certain carnivorous plants—the sundews and Venus flytrap (Droseraceae) and Old World pitcher plants (Nepenthaceae)—are closely related to Cronquist’s Caryophyllidae (Albert et al. 1992; Chase et al. 1993; Williams et al. 1994; Meimberg et al. 2000; Cuénoud et al. 2002). In addition, many families previously considered distantly related to Caryophyllales have been found to form a large clade with Caryophyllales (e.g., Asteropeiaceae and Physenaceae, Morton et al. 1997; Rhabdodendraceae, Fay et al. 1997a; Simmondsiaceae, e.g., D. Soltis et al. 2000). The strong support for this clade in recent multigene analyses (e.g., D. Soltis et al. 2000; Cuénoud et al. 2002) has led to a revised—and broader—circumscription of Caryophyllales by APG (1998) and APG II (2003). 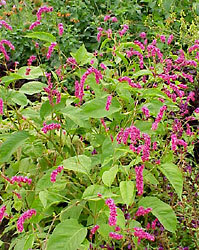 Because of the potential confusion introduced by applying the name Caryophyllales to a large clade, not all investigators have accepted this circumscription. For example, Judd et al. (2002) continue to use Caryophyllales in a narrow sense (= core Caryophyllales in APG and APG II) and refer to the larger, more inclusive clade as the caryophyllid clade. Although morphological and anatomical characters are generally consistent with these expanded circumscriptions, nonDNA synapomorphies for this newly recognized expanded Caryophyllales have not yet been discovered. Caryophyllales sensu APG II (2003) comprise 29 families, including Caryophyllaceae, Nyctaginaceae, Phytolaccaceae, Aizoaceae, Amaranthaceae (including Chenopodiaceae), Molluginaceae, Basellaceae, Cactaceae, Didiereaceae, a polyphyletic “Portulacaceae” and several small families, some of them of problematic placement, such as Frankeniaceae, Tamaricaceae, Asteropeiaceae, Rhabdodendraceae, Simmondsiaceae, Nepenthaceae and Droseraceae. Two other families have been proposed: “Agdestidaceae” and “Petiveriaceae”. Many members of Caryophyllales are adapted structurally or physiologically to extreme environments such as deserts, high-alkaline soils, high-saline substrates, and nutrient-poor soils. They have conquered these habitats through a variety of adaptations such as unusual photosynthetic pathways (crassulacean acid metabolism, CAM, and C4 as opposed to C3 photosynthesis), unusual morphologies (e.g., succulence), secretion of excessive salt by special glands, and unusual methods of nutrient uptake (e.g., carnivory). Given the distributions of these adaptations across Caryophyllales, it appears that most of these adaptations have arisen many times. Relationships of Caryophyllales to other major clades of eudicots remain unclear. Cronquist (1981) and Takhtajan (1980, 1997), on the basis of floral characters, viewed Caryophyllidae as being derived from Ranunculales-type ancestors. However, phylogenetic analyses using many gene sequences place Caryophyllales firmly within the core eudicots. They have alternatively been considered to be close relatives of rosids, asterids, or Santalales and are best regarded at this time simply as one of the major clades of core eudicots (e.g., D. Soltis et al. 2000). The sister group of Caryophyllales may be Dilleniaceae (e.g., D. Soltis et al. 2000), although this relationship had not previously been suggested. Further investigation is needed to assess this potential relationship between Dilleniaceae and Caryophyllales. Although many aspects of core Caryophyllales have been thoroughly investigated during the past several decades (e.g., chemistry by Mabry and colleagues, pollen by Nowicke and colleagues, wood anatomy by Carlquist and colleagues), revised views on the phylogenetic relationships of Caryophyllales require renewed efforts to identify synapomorphies and to reconstruct patterns of morphological, chemical, and anatomical evolution. Furthermore, the poly- and paraphyly of several important families of core Caryophyllales demonstrate that additional phylogenetic studies with increased taxon sampling are needed to resolve relationships and develop a truly phylogenetic classification. The most comprehensive phylogenetic study of Caryophyllales to date is that of Cuénoud et al. (2002), in which 127 taxa of Caryophyllales representing all 29 families were sampled for matK sequence analysis. A subset of this matrix was combined with sequences from rbcL, atpB, and 18S rDNA to provide a four-gene matrix for 26 genera of Caryophyllales. This combination of analyses strongly supported the monophyly of the expanded Caryophyllales sensu APG II. Within Caryophyllales are two large clades (core and noncore Caryophyllales, which Judd et al. 2002 referred to as Caryophyllales and Polygonales, respectively), with Rhabdodendron (of the monogeneric Rhabdodendraceae) and Simmondsia (of the monospecific Simmondsiaceae) unplaced. Albert, V. A. Williams, S. E., and M. W. Chase. 1992. Carnivorous plants: phylogeny and structural evolution. Science 257: 1491-1495. Angiosperm Phylogeny Group (APG). 1998. An ordinal classification for the families of flowering plants. Annals of the Missouri Botanical Garden 85:531-553. Braun, A. 1864. Uebersicht der naturlichen Systems nach der Anordnung derselben. In: P. Ascherson [ed. ], Flora der Provinz Brandenburg, der Altmark und des Herzogthums Magdeburg, vol. 1, 22-67. Hirschwald, Berlin, Germany. Eichler, A. 1875-1878. Blüthendiagramme I/II. Engelmann, Leipzig. Fay, M. F., Cameron, K. M., Prance, G. T., Lledo, M. D. and M. W. Chase. 1997. Familial relationships of Rhabdodendron (Rhabdodendraceae): Plastid rbcL sequences indicate a caryophyllid placement. Kew Bulletin 52:923-932. Morton, C. M., Chase, M. W. and K. G. Karol. 1997. Phylogenetic relationships of two anomalous dicot genera, Physena and Asteropeia: evidence from rbcL plastid DNA sequences. Botanical Review 63: 231-239. Soltis, D., Soltis P., Chase, M., Mort, M., Albach, D., Zanis, M., Savolainen, V., Hahn, W., Hoot, S., Fay, M. Axtell, M., Swensen, S., Nixon, K., and J. Farris. 2000. Angiosperm phylogeny inferred from a combined data set of 18S rDNA, rbcL and atpB sequences. Botanical Journal of the Linnaean Society 133: 381-461. Thorne, R. F. 1983. Proposed new realignments in the angiosperms. Nordic Journal of Botany 3:85-117. Thorne. R. F. 1992a. Classification and geography of the flowering plants. Botanical Review 58: 225-348. Thorne, R. F. 1992b. An updated phylogenetic classification of the flowering plants. Aliso 13: 365-389. Page: Tree of Life Caryophyllales. caryophyllids. Authored by Pam Soltis and Doug Soltis. The TEXT of this page is licensed under the Creative Commons Attribution License - Version 3.0. Note that images and other media featured on this page are each governed by their own license, and they may or may not be available for reuse. Click on an image or a media link to access the media data window, which provides the relevant licensing information. For the general terms and conditions of ToL material reuse and redistribution, please see the Tree of Life Copyright Policies.